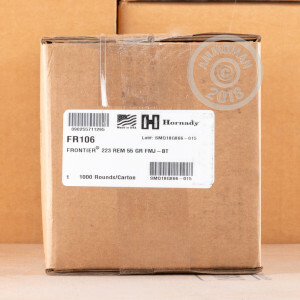 That there are 1,000 of these 223 Rem rounds by Hornady in one box immediately checks off the important quantity criterion that high volume shooters look for. But what about quality? That they’ve got in spades as well, because Hornady has spared none of their usual flare while creating them. The round’s 55 grain projectile wears a concentric and hard metal jacket, so it is not only intensely accurate but further feeds without hesitation through a semi-automatic and staves off rapid bore fouling as well. 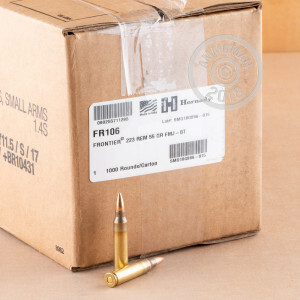 These rounds are particularly affordable because Hornady tagged the Lake City Army Ammunition Plant to aid in their production. Their brass casings are all essentially identical to one another, and offer extensive reloadability courtesy of their annealed shoulders and necks. This round’s primer is non-corrosive to guarantee that its stores well and treats an action gingerly, and its consistent propellant load delivers a muzzle velocity that you could set your watch to. This is versatile ammo that’ll give you great performance no matter how your firearm operates!